Websites change in two ways, big and small. There’s the big, revolutionary change of the redesign. A process that happens once every four years or so. Then there are the little evolutionary changes that happen in between. These are the tweaks, the enhancements and the support tickets. Each year, our clients request more than 1200 changes to their websites. Some are simple content changes. Others are serious maintenance with new features and integration. There are millions of things you can do with a website. Each of them has a cost and a benefit. The time/effort/costs needed to make changes varies from virtually no time at all (it’s done before the phone call is over) to literally months of planning, programming and testing. The results from these website changes also vary wildly. Some have a huge impact on marketing outcomes; some have none at all. So we’ve put together this little guide to help you make decisions about website changes over time and possible website enhancement ideas. Tweaking that title tag, adding that new section or dropping in a video. 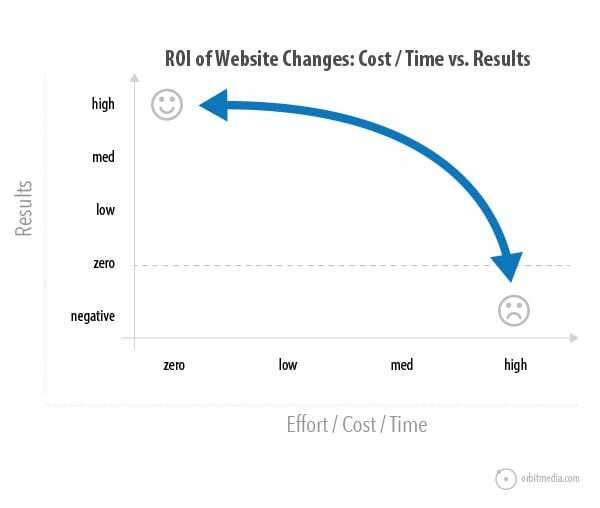 Every website update has a return (marketing benefit) on the investment (time and cost). Together, they can be plotted on a chart. Some changes require a lot of work and have no outcome or even a negative outcome. Some changes require very little work and may have big outcomes. Clearly, we want to make changes that help us reach our goals. Let’s start by taking a closer look at costs and benefits. Changes to websites take time, money or both. If you have a marketing team in-house and a website with a content management system (CMS), then changes to text and images don’t typically incur out-of-pocket expenses. These are basically free website enhancements. 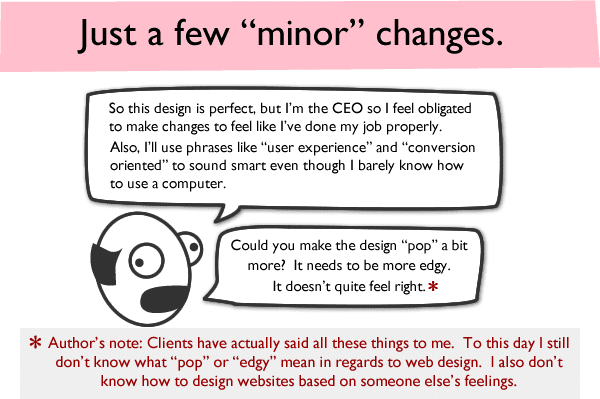 But design and programming changes mean calling your web developer. These changes don’t take a lot of time from the marketing team, but they ultimately mean getting a quote, approving it and paying an invoice. 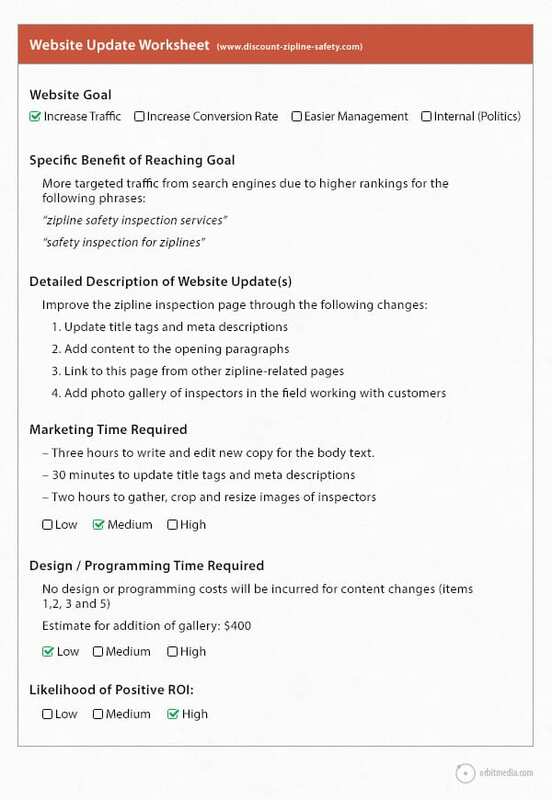 Here’s a quick overview of possible website enhancements. 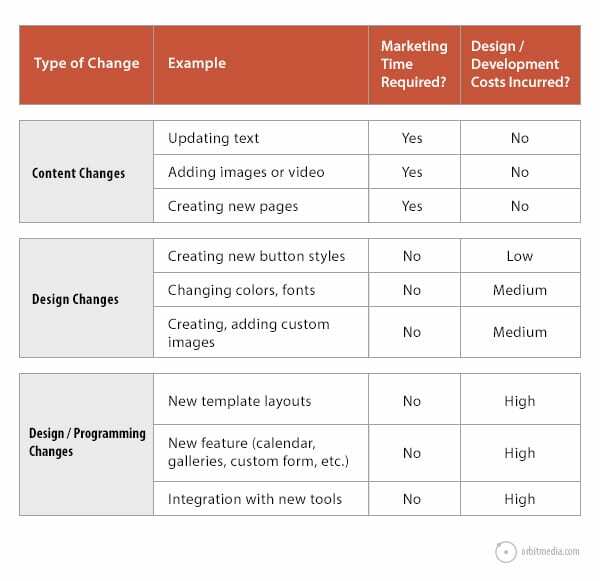 Before making any change to any website, ask yourself this question: what is the intended outcome of this change? Every investment into your website (or any aspect of your marketing) should align with a goal. Business goals lead to website needs. Online goals are usually sales leads (or ecommerce transactions) through more traffic or a higher conversion rate. That’s how websites make money after all. Increase Traffic: Grow brand awareness and top line traffic levels through better alignment between the website and search, social, email and paid traffic activities. 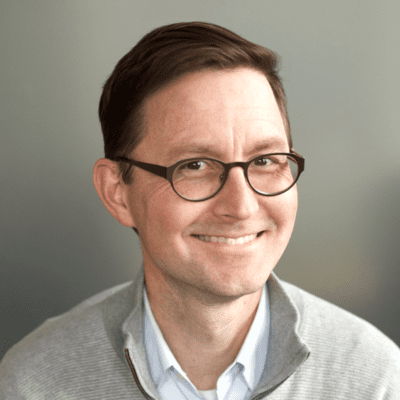 Increase Conversion Rates: Maximize the percentage of visitors who take action through website updates that align with visitors perspective and psychology. Easier Management: Make the site a more efficient marketing tool through more flexible template and tools, so no update takes any longer than necessary. Integrate with other systems when practical. Internal Politics: Keep people happy, especially highly-compensated, highly-opinionated people. Let’s be honest, some website changes don’t have any practical marketing purpose. Caution: Beware of opinions! If you’re in a meeting about website changes and someone states an opinion, look for evidence to support or refute that opinion. You can probably find it Analytics, which a great tool for making better decisions about website updates. 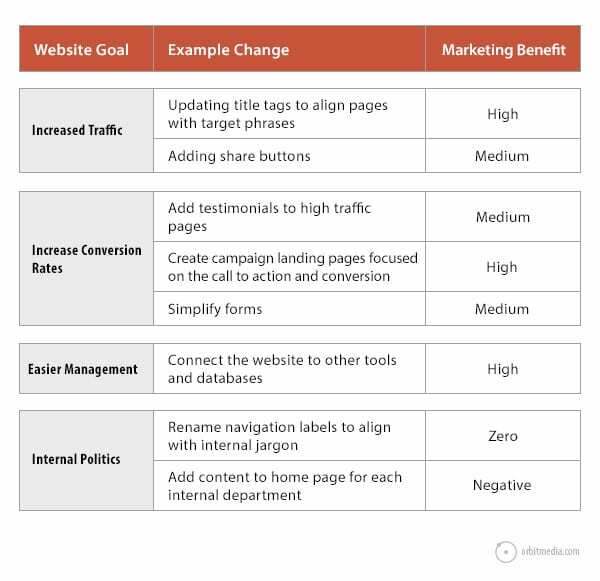 Now let’s look at examples of website changes that align with these goals and see how the benefits matchup. Adding a design element that pulls the visitors attention away from a call to action. Building an expensive feature that will rarely be used. Updating the title tag of a page that already ranks high for a valuable phrase. The most important aspect of this little exercise? The goal. Without a clear statement of the purpose, the risks of action without outcomes are too high. Unsure about the possible results? Test. Of course you are. It’s nearly impossible to ever be totally certain about the outcome of any marketing action! But you can still be totally clear about the goals and look carefully at the costs. If the costs are low, try it quickly and measure the impact. If costs are high, weigh the risk and proceed with it as a test. Or prioritize the lower cost updates, making the bigger changes after you’ve exhausted the smaller, simpler updates. What about your last change? Go back and check your Analytics to see the results. How did you do? Did you improve traffic or conversions? Before or after any change, think about your Analytics. If you’re not making decisions based on data, you’ll never meet your goals. Eventually, you’ll hit the point of diminishing returns with enhancements and updates. The evolutionary changes reach a limit and it’s time for the revolution: the complete redesign. A well-designed, easily updated website has a lifespan of 3-5 years, depending on the business and the industry. After this time, the site has fallen behind. Updates don’t help anymore. Stop making updates and plan the redesign. Bring your focus on results into the plan for the redesign, create the plan with a focus on website redesign ROI. Whether it’s little tweaks or a complete overhaul, remember this: websites are never finished. Digital ink is never dry. I’m sure some of you have your own thoughts on this. We’d love to hear them in the comments below. As always, great information to have and practical. Now, when do you know it’s time to admit the tweaked site needs a total redesign? Spot on as always! Thanks Andy. Another big Goal I might add would be “Improve User Experience”, where the measurement would be things like Bounce Rate, Time On Site, Pages per Session, etc. Of course, these things may also indirectly improve search engine rankings & conversions as well! Andy, as always, thanks for this. I am redesigning both my orgs’ websites, and even though some changes tied to a goal, some were “this just looks outdated.” I’m using your suggestions to revisit each site, ask questions, and then give our developer direction based on our goals, vs. what I think we need. ps – last thought – I would have loved a downloadable checklist. Great use of the graph up top Andy! After seeing the diagram, I’d believe everything you say haha. Also, this is a great handy article. You could have a part 2 about things to keep in mind in order to avoid making marketing worse when making changes to a website. Nice, clear decision making process I look forward to sharing with our team. Would love downloadable version of the worksheet(s).